SuperPost pallet storage racks closed tube option is available in both Interchangeable and T-Bolt bolted connection. Manufactured as a solid tube, SuperPost offers a much higher resistance to impact that is common in normal busy warehouse storage activity. Columns are automatically welded closed during the milling process and mitre-cut bracing is welded against the post for superior torsional resistance. 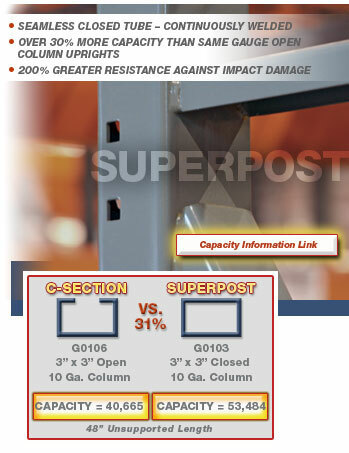 Not only is SuperPost more resistant against abuse, it also carries up to 35% more than an open section pallet storage rack uprights of the same gauge. SuperPost is a more cost effective solution than heavier open section columns for Pick Modules or warehouses and distribution centers that require a higher capacity upright. UNARCO is one of only a few manufacturers of closed tube pallet storage rack uprights in the industry. The benefits and cost savings are very visible in not only the design savings but also in the more durable long-term solution of a closed tube upright. Another SuperPost benefit for food or health industries is the cleanliness that a closed section offers by preventing dirt and debris from accumulating inside the column around the baseplate in a warehouse. Any damaged element can put all of warehouse pallet storage racks at risk. Why not get all of the impact protection, added capacity and benefits of a closed tube upright available with UNARCO’s SuperPost? Closed tube pallet storage uprights can be manufactured for T-Bolt rack or Interchangeable Rack beam connections. In addition, Interchangeable pallet storage racks are available with side punching for attachment of accessories or durability add-ons. For more photos of SuperPost Pallet Storage Racks view UNARCO Pallet Rack Photo Gallery.